On the morning of the first day of third grade, my 8-year-old son nervously and quickly set his well-loved backpack against the brick wall in front of his classroom. “Uh … that’s okay. I don’t really want my name on it anyway,” my son said quietly, shuffling his new tennis shoes, turning towards the playground. “I just don’t want to,” he said again, taking another step towards the playground. Puzzled, I glanced at all the backpacks neatly lined up against the brick wall. It looked as if many of the kids in his class had moved on to bigger, newer backpacks with bold bright colors, army designs … one with neon stripes. The backpacks certainly seemed a bit more edgy this year. I looked at my son’s rolling backpack, the one and only one he has ever owned (a hand me down at that) — and I noticed how much more squat it was next to his peers. I also noticed how that chubby, grinning lizard on the upper right hand corner seemed a little childish in this context … and how the edges were a tad dingy and frayed and loved off. “Hmm,” was all I could say again. How did this little guy turn EIGHT and decide he wants to be all grown up? They say you have to pay attention to that middle child because he can slip through the cracks. They sure aren’t kidding about this. If my often distracted mind didn’t catch it before, I knew it then. He was actually embarrassed. And this was a new feeling for him. I reasoned, but that backpack still rolls perfectly. It has absolutely flawless wheel action. It’s totally possible that he could roll this thing right into college! Plus, kids need to know backpacks don’t grow on trees, right?! I’ve never cared for this term, but my son is a “late bloomer.” At least this is how the world sees him, and how we’ve come to understand him. He continues to need speech therapy to pronounce his “r’s” and continues to stutter and stumble over his words at times. He has sadly been talked over and talked FOR too many times to count. “Out in the world,” he tends to get lost in the shuffle, forgotten because of his quietness, seen as younger because he hasn’t hit any noticeable growth spurt. He’s that kid who still doesn’t know how to swim or ride a bike without training wheels — partly our doing and partly because of his un-readiness for all these things. He was the last in his grade to lose his front teeth. Honestly, he’s the kind of boy you just want to shelter … for like, forever. “Can I go to the morning assembly now, Mom? I don’t wanna be late,” he pleaded a little impatiently. “Alright. We don’t have to put your name on it then,” I called after him. 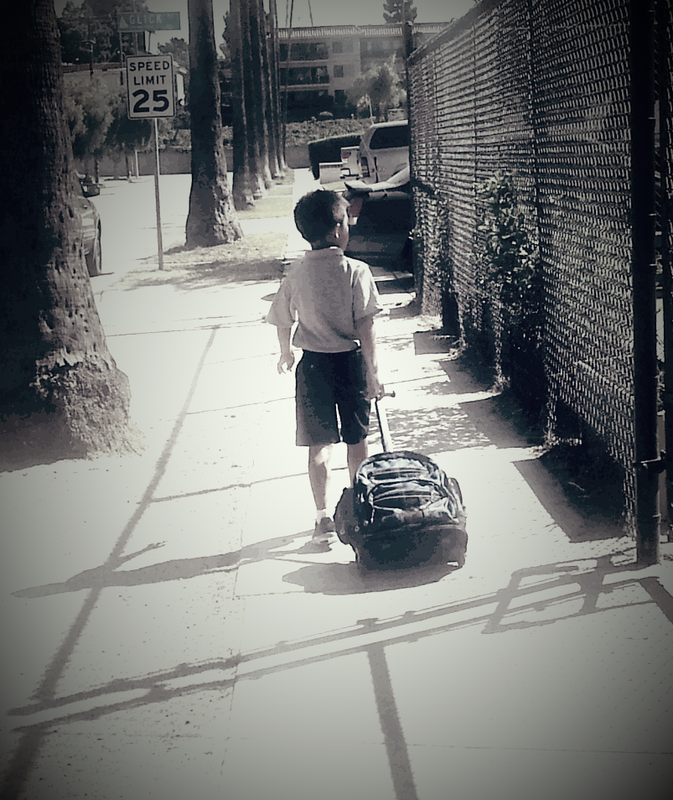 I watched him dart off to join his classmates for the first assembly of the school year. I watched him as he quietly added his small frame to the end of the line of towering third graders … kind of like a dot to the end of a sentence. I just stood there, wondering. What will he learn this year? Maybe he’ll learn to consistently start his sentences with a capital letter. Yes, finally! Maybe he’ll learn to swim or ride a bike. Sweet relief! Maybe he’ll make a goal this soccer season or become more socially confident. Woo-hoo, awesome!! But then these small darts of truth struck my heart. What does he really need to learn this year? What should I be on my knees PRAYING that he knows this year? 1. Just be you. You are wonderfully and fearfully made, by a wonderful and fear-worthy God. Your potential reaches to the moon and back. But someone will always be taller, faster, funnier, better. Be happy for them. God has made you uniquely who you are for a purpose. 2. Keep trying. Raise your hand, sign up, join the team, simply get up and try again. Your job is to learn as much as you can — this is how you’ll grow. Don’t give up. Perseverance is the only way through sometimes, and it builds your character and prepares you to do great things. 3. Always do your best. As long as you do your best, it’s completely okay if you’re last. 4. Be a friend. You don’t have to be talkative to say something kind or to ask the kid who is left out to play with you. It’s okay to feel shy, but there are times you have to reach out to others despite how you feel. Forgive quickly. Remember everyone needs forgiveness, even you. Loving others is the only real way to show Christ to them. 5. Express yourself in truth and love. Your words matter. What you think matters. Your feelings matter. But speak them with honesty and love. Know above all, listening is still most important. 6. Be brave. Life will ask you time and time again to be brave. But being brave doesn’t mean you’re not scared. It just means you showed up ANYWAY … and you showed up even when everyone has a newer and bigger and better backpack than you. That’s actually called courage, my little guy, and this never gets old. The backpack is not so bad, right? This was truly such a touching post. I feel tears against my face reading this. Such a sweet boy, he is lucky to have a mom like you. Aww thanks for sharing your thoughts. He is a sweet one … it’s very bittersweet to watch him grow up right before our eyes. Thanks for your sweet and encouraging words. 🙂 Raising kids is such a humbling experience … they have a way of teaching us so much without knowing it! I think that is a great backpack – but how amazing that you were able to get behind his eyes to experience his feelings about it. I think a lot of moms would not even have noticed. Your kids are lucky to have you for a mom! Thank you for the beautiful post! Thank you so much. I appreciate your kind words. 🙂 There is still so much more for me to learn! Every year brings a new season … new changes, challenges, and blessings too! I really like this. And I’m glad you were sensitive enough to pick up on his feelings and meet him right where he was at. You are a good mom. I look forward to reading more of your posts! Ha ha … yes! Very accurate description of these boy/little men. What are we going to do? Thanks for the backpack tip …and for your great comment!